According to the Institute for Diversity and Ethics in Sports, 85 percent of newspaper sports reporters are white. These numbers are even higher in editing positions. The numbers for entertainment reporters are not nearly as high, but both fields are largely run by white males. It is highly likely that these reporters and editors will write about race in either sports or entertainment during their careers.  This section is designed to help them produce stories that address race accurately and in a manner that fairly portrays groups that have struggled with marginalization by the media for decades. In the late 1940s, two athletes at the University of California-Los Angeles made history that would change the entire landscape of sport in America. Kenny Washington, a running back, became the first black athlete to sign a contract in the NFL in 1946. A year later, Jackie Robinson, a multi-sport athlete at UCLA, broke baseball’s color barrier by signing with the Brooklyn Dodgers. At the same time, African Americans were also having breakthroughs in movies, television and music. Though the breakthrough of non-whites into both sports and entertainment is significant, it does not explain the entire story. Despite breaking gender and racial barriers, racial and gender minorities still struggle to receive treatment equal to their white male counterparts. The struggle for athletes of color begins when they are being recruited out of high school. Often, colleges will recruit athletes from under-resourced backgrounds. Though it is commonly believed that black athletes are superior because of their genetic makeup, studies show that this is a false stereotype. When it comes to recruiting, big-time college programs look for athletes who will help win games and make money for the school. Colleges may not pay much attention to the athlete’s overall college experience, including academics. Between 2007 and 2010, black men were 2.8 percent of full-time undergraduate students, but 57.1 percent of football teams and 64.3 percent of basketball teams. 96.1 percent of the schools surveyed had graduated black male student athletes at a lower rate than student athletes overall. 97.4 percent of the schools surveyed had graduated black male student athletes at rates lower than undergraduate students overall. Even though schools struggle to graduate black males in basketball and football, they are rarely punished by the NCAA for failing to do so. The University of Arizona, which graduates just 14 percent of its black male basketball players, was put on NCAA probation in 2010. None of the violations was connected to the school’s low graduation rate of of these basketball players. Athletes of color who can make it professionally face additional struggles. For one, the percentage of black athletes in the four major sports leagues (MLB, NFL, NHL and NBA) is largely disproportionate to the racial makeup of the fans who watch these sports. Black athletes also can be shaped to fit certain stereotypes, often portrayed as undisciplined, wild and arrogant. 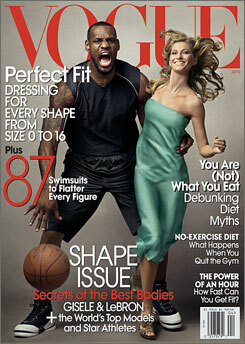 A 2008 Vogue magazine, for example, decided to depict basketball star LeBron James as a King Kong-like figure. On the field, black athletes may face discrimination when it comes to their positions on the field. Certain positions, like the quarterback in football, are more likely to be filled by white players, while black athletes are linebackers and tackles. In addition, a study from the Journal of Sports Economics found that black quarterbacks are about twice as likely to be benched as their white counterparts. This is true despite the fact that the team tends to improve when white quarterbacks are benched more than when black quarterbacks are benched. Other non-white males, such as Hispanics and Asian-Americans, face challenges in major professional sports. Baseball recruits a large number of Hispanic players, but teams don’t always hire enough translators to help them. Women in general are seen as less capable and weaker than male athletes. As a result, women usually receive less money and less media coverage. These portrayals have led media companies to justify not covering women’s sports. As the Women’s Sports Foundation points out, because most sports editors across America are white males, they emphasize men’s sports. The result is compounded when looking at black and white female athletes. Race can play a significant role in endorsement money, for example. Serena Williams, who has won 21 Grand Slam Singles titles in tennis, earned $13 million in endorsements in 2015. Maria Sharapova, meanwhile, made $23 million in endorsements in 2015 with five Grand Slam titles. Though black males cover a large majority of pro sports, their teams are largely owned and managed by white men. In the four major professional sports leagues, just five are non-white men. Professional leagues have also struggled to hire coaches and managers. During the 2016 season, Major League Baseball had two black managers and one Latino manager, despite the fact that 30 percent of the league’s players came from Latin America. The NFL tried to promote the hiring of coaches who are racial minorities by implementing the Rooney Rule in 2003. This rule requires NFL teams to interview at least one coaching candidate who is a racial minority. Yet, aJanuary 2016 study indicates that white position coaches and assistants are more than twice as likely to be promoted than their black colleagues, no matter what the coach’s background or experience. When the 2016 Oscar nominees did not include one black actor in the top four categories, the reaction to the lack of inclusion was strong. Yet, little will change with a voting base that is 94 percent white for the Academy Awards and 70 percent white among the Screen Actors’ Guild. According to the 2015 Hollywood Diversity Report from UCLA, 16.7 percent of lead actors in movies released in 2013 were from a racial minority, despite the fact that racial minorities make up 37.4 percent of the U.S. population. 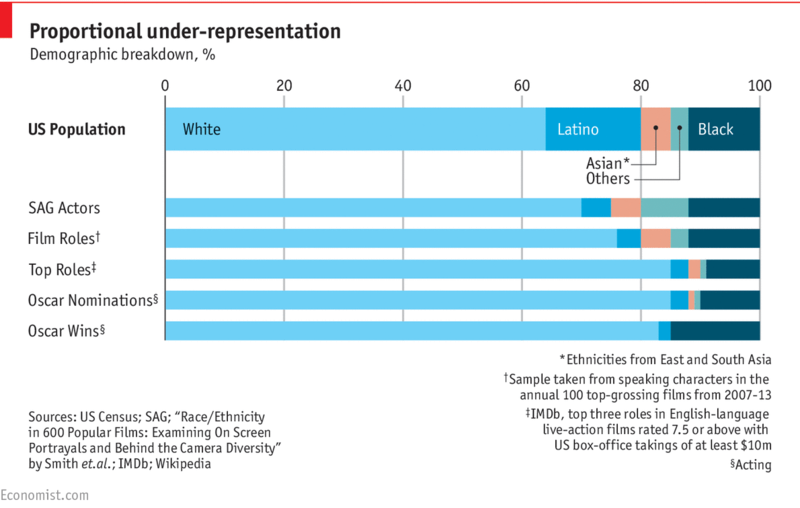 The Economist reported that the lack of diversity has to do with the absence of directors from racial minorities. Of the top 600 films from 2007-13, blacks directed only 6 percent of the films, according to a study by the University of Southern California. Although racial minorities are not well-represented on the screen, they go to the movies more often than whites, relative to the U.S. population. According to a 2013 report from the Motion Picture Association of America, Latinos accounted for 32 percent of frequent moviegoers (a term used to describe people who go to the movies more than once a month) despite only making up 17 percent of the U.S. population. In the past year, black artists have made headlines with their music about issues in the black community. Kendrick Lamar wrote about police brutality and referenced it at a 2016 Grammy performance. Beyoncé made waves with her single, “Formation,” and her album, “Lemonade.” In her music, Beyoncé sings about black heritage and the issues black women face. In her music videos, she brings up highly charged topics, such as the political storm around Hurricane Katrina and the Black Lives Matter movement. Don’t dismiss a racial, ethnic or gender issue because it makes you feel uncomfortable or you don’t understand it. If a racial, ethnic or gender group isn’t being represented, be sure to ask why. Assuming someone’s interests based on their race is a bad idea. It’s also important to look at how you are portraying female athletes in your coverage. When reporting on crime in sports or entertainment, consult with your newsroom about the policy on mugshot photos. By posting mug shots of Latino or black men, the stereotype that black or Latino men are criminals can be perpetuated. If you see a pattern in coverage, look at the trend and see why an issue repeats itself. Example: If you consistently write about black athletes in poor, underserved neighborhoods in a community, examine the neighborhoods to root out the stubborn issues that depress an area.